Hide deals from seller "Magic Flowers"
Limit 1 per person. Valid on 50-flower bridal bouquet. Includes 25 Vendela ivory roses, 25 Stephanotis flowers, rhinestone handle, and either 25 rhinestone cuffs or 25 pearls. Customer may choose a different color of roses free of charge. By appointment only. Promotional value expires 365 days after purchase. 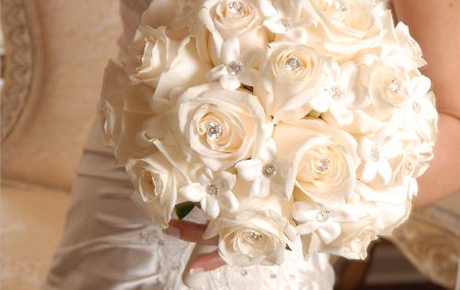 Make your wedding bloom with 50% off a 50-flower bridal bouquet from Magic Flowers in Harwood Heights ($250 value). This artistic floral arrangement includes Vendela ivory roses, Stephanotis flowers, a rhinestone handle, and rhinestone or pearl accents. For more than 35 years, Magic Flowers has created custom floral arrangements to add a beautiful touch to weddings and special events. The floral designers create one-of-a-kind arrangements to match the color scheme of your wedding with their vibrant flowers and lush roses. Their expert florists will consult you to ensure your bouquet is the perfect complement to your wedding dress and décor. Let love bloom with this stunning deal. Floral design company in Harwood Heights offering wedding and special event services.